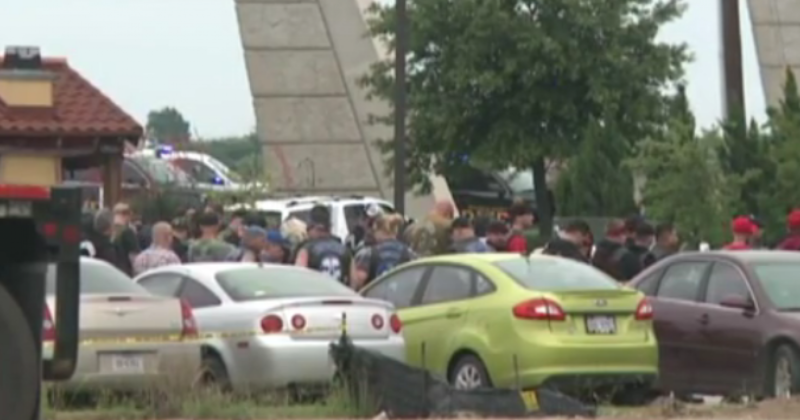 Nine killed in Texas biker gang shootout. Texas authorities say multiple people were killed in a biker gang shootout in Waco on Sunday, with local media saying the number may as high as nine. Local media say a fight broke out between rival biker gangs. WACO: (May 17, 2015) Three rival motorcycle gangs turned a local restaurant into a shooting gallery Sunday afternoon and when the gunfire was over, nine people were dead and 17 were injured..
Waco police Sunday afternoon, assisted by Department of Public Safety troopers, police officers from several cities and deputies from the McLennan County Sheriff’s Office were surrounding the Twin Peaks Restaurant, in the Central Texas Market Place after several people were reported shot during a rival motorcycle gang fight, Waco police Sgt. W. Patrick Swanton said. Police and troopers were in the parking lot trying to secure the area and protect citizens when a fight broke out inside the restaurant and spilled into the parking lot. Gang members were shooting at each other and officers at the scene fired their weapons, as well, Swanton said. The scene at the Market Place between Don Carlos and Twin Peaks was absolute chaos, Swanton said.